A special reading of Lewis Carroll’s poetry, hosted by Virgogray Press, will take place at the Calcasieu Gallery on March 13, 2010 at 5:30 PM. A brief open mic will follow. Virgogray Press publications will also be available for purchase. Carroll Through the Looking Glass is an official Contemporary Art Month exhibit and opens during Luminaria. 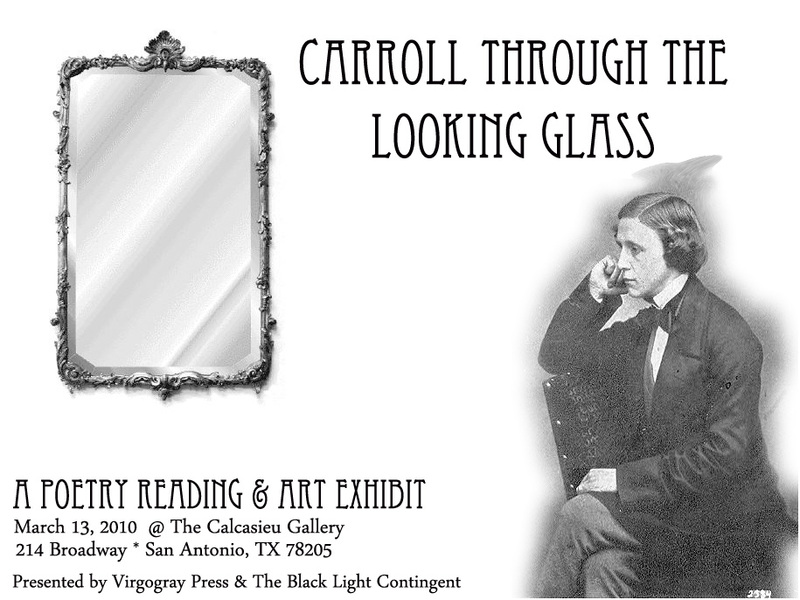 The Black Light Contingent presents “Carroll Through the Looking Glass,” a presentation of art inspired by the life and work of Lewis Carroll, author of Alice in Wonderland and Through the Looking Glass. The Contingent will present several of Carroll’s works including Alice In Wonderland, poetry from his seminal collection, Phantasmagoria, his humorous play Euclid and his Modern Rivals and will highlight interpretations of his work, published under his real name, Charles Ludwig Dodgson, “The Tangled Tale” and “Curiosa Mathematica: A New Theory of Parallels,” the latter a notable excursion into shedding light on some of the work Carroll produced as Head Lecturer at Oxford University. The Black Light Contingent will truly illuminate the manuscripts of Lewis Carroll with their visually stunning ultraviolet exhibit, a presentation of fluorescent work in homage to a literary master who inevitably captured the imagination of generations.